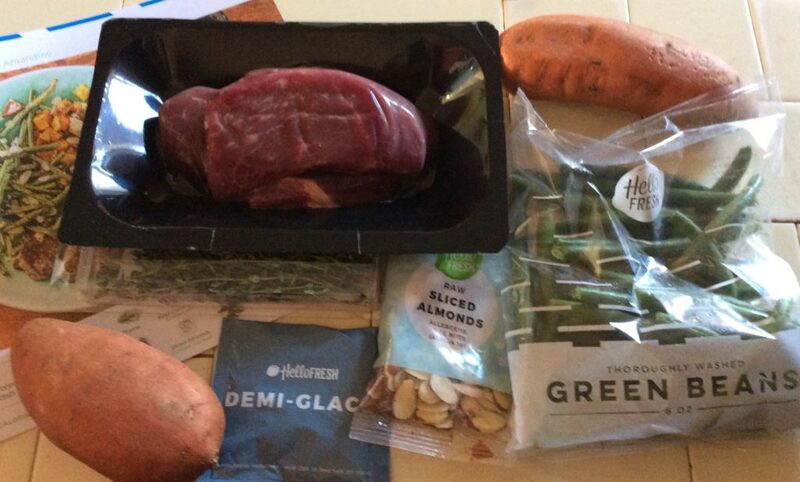 This, indeed, is one of the problem with HelloFresh: their photos don’t make the food appear particularly enticing. To be honest, neither does the description of the dishes. Most of them sound totally boring – and yet everything I’ve had from them (albeit, it was just four meal kits) has tasted good, if not great. And this recipe has probably been the best of the bunch. The “ranch” steak was good in itself, but the pan sauce was amazing – it made me a convert to demi-glace. I’m not the biggest fan of sweet potatoes, but I liked them served in this manner and they were perfectly cooked (per the instructions), and not at all chalky, as they can get. The combination with abundant thyme was also great. And the green beans weren’t too shabby either. All in all, this meal was of the quality you’d expect at a nice restaurant (one in which they serve boring side dishes, as they do in my town). Most amazingly, it wasn’t even part of HelloFresh’ “gourmet” offerings, so it was regular price ($22 to $24, depending on your plan). All the ingredients in the kit arrived in good condition. I was a little surprised at just how much thyme there was, but it was all used.The recipe didn’t call for peeling the sweet potatoes, but I did anyway. The only real issue is that one of the steaks was significantly thinner than the other, so it required less cooking. The portions were good and we actually had leftover sweet potatoes/beans. Making the meal was pretty straightforward, and the only thing I had to watch for was cooking each steak for a different amount of time given their relative thickness. In all, if you have HelloFresh, I’d recommend this meal. And if not, I’d recommend making it with your own ingredients. 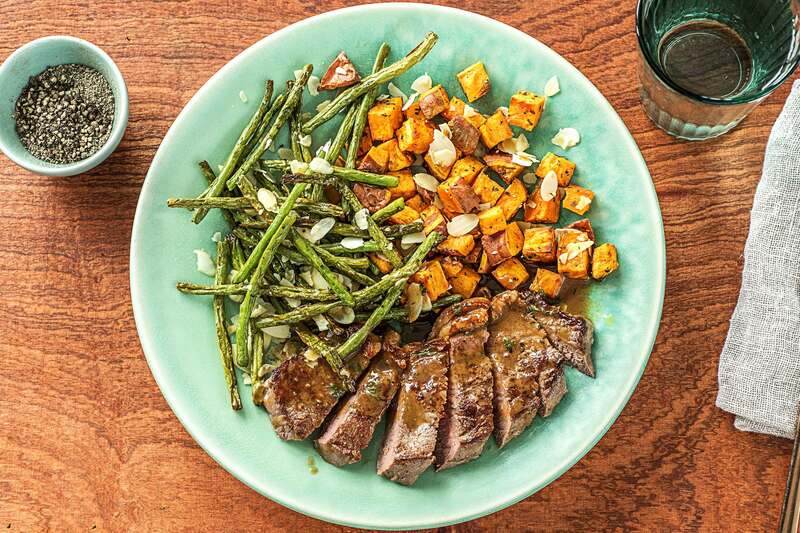 You can sign up for HelloFresh using my referral link and get $40 off your first week, which is a very good deal. 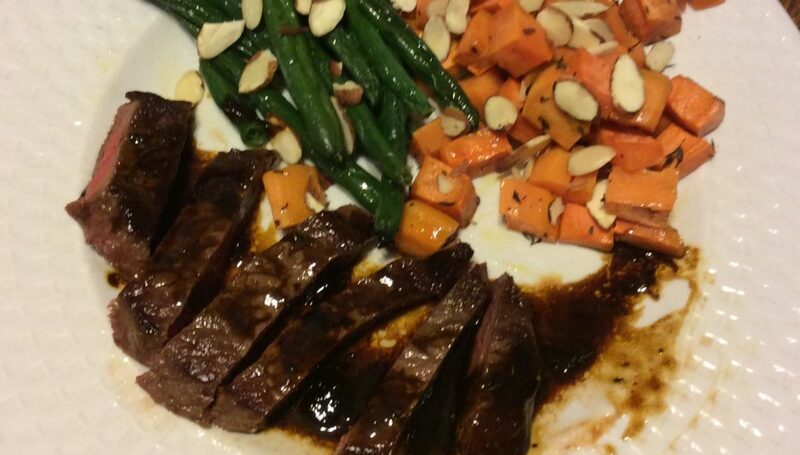 Make this recipe on the pan where you’ve pan-grilled or broiled steak,with the pan juices are your base. Place pan with pan juices over medium-high heat and add the demi-glace and water, crapping the bits of browned meat from the pan. Simmer until slight thickened, 1 to 2 minutes. Turn heat off and mix in the butter. Taste and season as needed. Preheat oven to 400°F. Cover a baking sheet with aluminum foil. Peel and cube the sweet potatoes into 1/2″ cubes. place on one layer on the baking sheet. Sprinkle with thyme and salt and pepper. Drizzle with olive oil. Bake for 25 minutes. Remove to serving plate, sprinkle almonds on top and serve. Make the green beans amandine by following the recipe for the sweet potatoes above, don’t use thyme and cook for 15 minutes only.